Priscilla is Head of Clarke Willmott’s national construction practice of twenty five lawyers. She is also the Head of the London office. Priscilla has approaching 30 years’ experience advising on high value and complex transactions for a broad range of clients. She is also on the firm’s management board and Sector Head of the firm’s Energy and Natural Resources practice. Priscilla has significant and wide ranging experience in general commercial construction projects for clients who operate, for example, in the logistics, retail, office, and leisure or infrastructure arenas. Priscilla also has particular expertise in projects spanning various renewable energy mediums such as wind, biogas, and energy from waste and solar. Priscilla has contributed to numerous conferences and workshops for clients. Priscilla has an MSc in Construction Law and Arbitration from King’s College London. 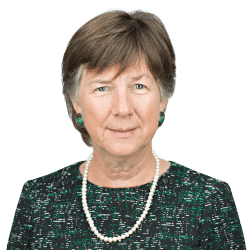 She trained and subsequently practiced at Nabarro Nathanson, as it then was, before setting up the construction practice at Osborne Clarke where she was a partner before joining Clarke Willmott as a partner in 2005. Priscilla acted for a consortium of developers in relation to a proposed new town just outside Exeter. The first phase included around 2,900 houses together with a town centre, neighbourhood centre, new schools, retail and leisure developments. Priscilla negotiated the arrangements with a major utility company to design, install, operate and maintain a local energy centre featuring a combined heat and power plant to serve the domestic occupiers of the development (on a shared basis) and neighbouring commercial developments. Priscilla advises the UK arm of a German company in respect of its roll out development programme of anaerobic digesters in the UK which has included drafting and negotiating turnkey construction contracts as well as multi contracts, escrow bank account agreements, parent company guarantees, maintenance and biological agreements. Advising an international food retailer in relation to the development and maintenance of their entire UK network of stores and warehouses. Priscilla and her team manage the construction contract process for the client’s ambitious roll out programme in relation to building contracts, infrastructure, demolition, ground investigation, consultant appointments and other ancillary construction documents using bespoke templates drafted by Priscilla and her team. This involves a carefully structured approach to procurement using framework agreements and orders with over 200 third parties.